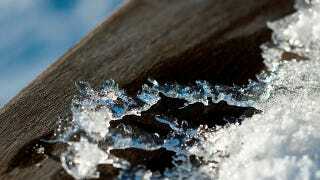 At zero degrees Celsius, liquid water freezes into ice. That should be the end of the story, but under very special conditions, frozen water can flow like a liquid. This frozen flowing water could be found on other planets. This unusual water was produced in an experiment by Ove Andersson of Sweden's Umeå University. He first froze water to temperatures below negative 130 degrees Celsius, and then he slowly subjected the ice to pressures far in excess of normal. When the ice was put under pressures 10,000 times normal, its molecular structure became disordered, and the ice went from a solid, crystalline structure to an amorphous, slowly flowing goo as Andersson slowly raised the temperature. "The finding is also interesting in that it helps us understand the many abnormal properties of water. For example, it has been predicted that water would have two different liquid phases at low temperatures. The finding supports the existence of one of those two phases...When I then raised the temperature, the ice transformed into sluggishly flowing water. This water is like regular water but its density is 35 percent higher, and the water molecules move relatively slowly, that is, the viscosity is high." As Andersson explained, it's thought that the water we're familiar with is only its high temperature, low pressure form, and there might be another two distinct liquid forms that can be achieved with low temperatures and high pressures. Since water crystallizes as it freezes into ice, there's no easy way to produce these forms. Andersson's approach, which first required the creation of amorphous goo, provides the first experimental verification of one of the two high pressure phases. Best of all, it's possible that these different forms of water are not purely creations of human laboratories. While the conditions Andersson used to create the amorphous ice were fairly extreme, it's possible that planets and other celestial bodies could support this type of water instead of our low pressure liquid. Via PNAS. Image by Jar() on Flickr.